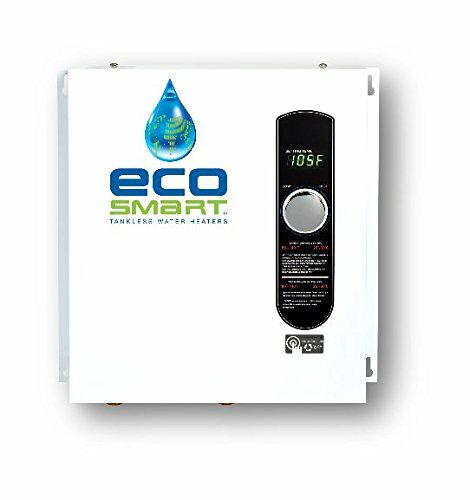 With an emerging global consciousness towards environmental friendliness and energy efficiency, tankless water heaters have recently gained popularity across the world. They have become particularly in the United States, despite being common in other some other parts of the world. With the influx of new products on the market these days, be it electric or gas powered tankless water heaters, the choices are countless. For this reason, I have put together, a list of the best tankless water heaters on the market today, along with an in-depth look into what makes them special and the factors you need to consider before deciding which heater is the best product for you. 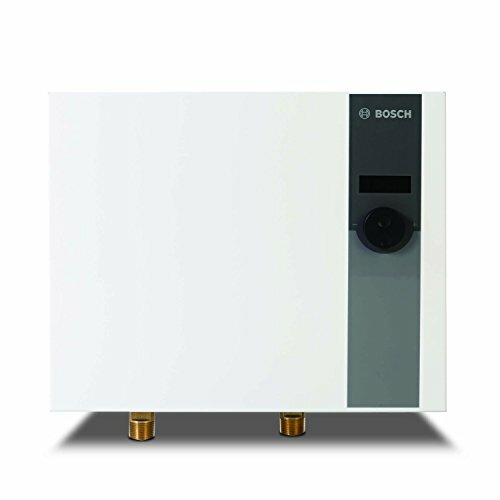 Below you will find the top-rated tankless water heaters on the market today. The Stiebel heater is great for homes with a higher demand for hot water during certain periods of the day. The Tempra’s exclusive advance flow control feature allows it to self-allocate and distributes water so that you do not have to worry about water running out. When demand for water is high, it will automatically reduce the flow of water slightly so that a consistent temperature is maintained. In addition to the conventional benefits such as energy efficiency and consistent hot water supply, the Tempra will also provide some added benefits. Since it is an electrical unit, another plus point is that you will not have to worry about venting or exhaust systems like in propane heaters. Simply mount it on the spot of your choice, and the majority of your work is done. It also helps that it comes in a sleek and compact design, meaning it was made for the express purpose of seamlessly merging into your house without taking up too much space or requiring major adjustments. This theme of seamlessly merging into the house is furthered by the fact that it is completely silent, owing to its electricity-based mechanism, which gives you even more flexibility when choosing the right place to install the Tempra in your home. To top it all off, these thoughtful design features, combined with high-quality German-made hardware in the form of solid copper heating chambers, make for a highly reliable piece of technology. It is no surprise then, that StiebelEltron offers a seven-year leakage warranty and a three-year warranty on parts, for their entire range of Tempra water heaters, including this one. When it comes to outdoor water heaters, Eccotemp is the name of the game. The L10 unit is designed specifically for the rugged outdoors. If you are a camping expert, or simply enjoy staying at your cabin every now and then, this product will serve you well. There are various features that help the L10 in adapting to all kinds of outdoor environments. It comes in a small and lightweight body that is easy to store and transport, and is designed to work well with added components such as an electric pump or any kind of shower head up to a field-tested height of 5500 feet. It also uses liquid propane as its energy source, which means it will work even in areas where you do not have access to electricity. In addition to that, the L10 is accompanied by a rain cap that ensures that it works smoothly, even when it is raining. The L10 helps you save energy with its manual temperature and pressure control; so that you decide how much water you need, based on the kind of conditions you are using the heater in. Even though the ignition is manual and battery powered, it has an automatic shutoff timer, set at 20 minutes to make sure no energy is wasted. The best part is that the half-inch NPT lets you connect to a garden hose so that you can use it to bathe your dog or horse even when you are not out in the wilderness. From the harsh outdoors, we now come to the comforts of indoors. If you are looking for a heater to install in a small house or apartment with about two bathrooms, look no further than the Takagi T-k Jr2. 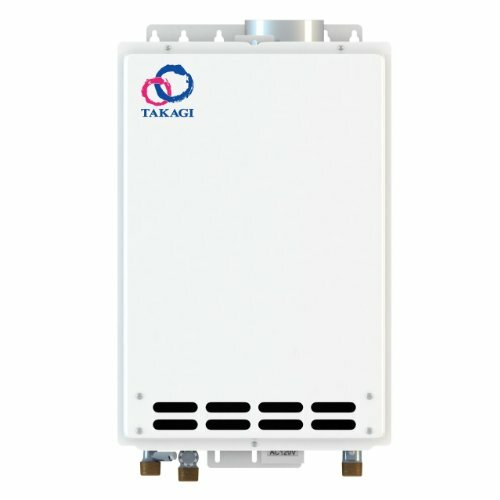 As one of the smallest heaters in the Takagi’s line of tankless water heaters, it is designed to be simple efficient and effective. The small size allows you to mount it even inside a closet or simply hang it from a wall without having to worry about how it affects your living space. This gas powered model is rated between 19000 BTUs to 140000 BTUs per hour, and requires a grade 3 stainless steel venting system, it also comes with its own stand-alone exhaust outlet. It can also be switched to LPG for situations where you do not have access to natural gas, and provides a stellar output flow rate of about 6.6 gallons per minute, with an energy rating of 0.82. In order to ensure complete safety, the T-K Jr2 has electric ignition so that you can have absolutely zero physical interaction with the fuel source. Current users of the T-K Jr2 generally credit their satisfaction to its simplicity. It does not boast many fancy features but does the one job it is meant to do, which is providing the user with a consistent, uninterrupted supply of hot water. The exhaust requirements might require some extra work at first, but it will be negligible in the long run, considering the 13-year warranty that this heater comes with. 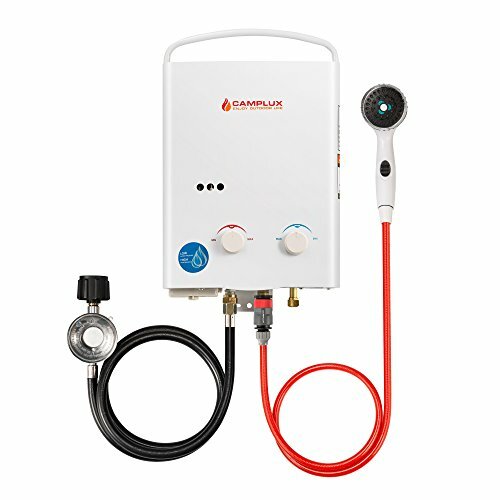 The Camplux heater is the best outdoor portable tankless water heater unit that is good for taking on camping vacations. Its size is more compact along with a foldable handle that makes it functional for outdoors. You can also fit it into indoor ventilation systems because it comes with Oxygen Depletion Sensor Protection. One of its features is that it provides you with an ignition option with 2 “D” batteries. This means that you can operate this water heater with or without it. The water heater’s performance is great even at low water pressure. For example, if the pressure ranges between 2.5 PSI and 110.0 PSI, the outdoor portable heater will easily perform its function. For the 1.32GPM Camplux, temperatures between 114.8℉ (46℃) and 46.4℉ (8℃) are best. This heater can also work well when the water system is attached to a 12-volt pump. The Camplux water heater is equipped with energy saving technology in which you can instantly get hot water. Its output of hot water is 1.32 GPM and the pressure is 0.4PSI generated using 34000 BTU per hour. If there is improper installation of this heater, gas leakage can occur, so do not overlook putting the gasket into the adapter before installation. This product is easy to set up and you can get hot water immediately. You can also configure the wall hanging heater by using a foldable handle. You can also easily connect the cylinder with the regulator and the hose. Start using hot water by connecting a shower hose and head to the outlet, and the water hose to the inlet. Insert your 2”D” batteries in the heater and you will instantly have hot water. The SioGreen is the member of the latest generation of electric heaters. As compared to previous technologies, there is no metallic heating tube used. An inject-heating BTU into water is passed over the heating exchanger. There are Quartz heating tubes used in this unit. Quartz has been used for many years because it provides thermal properties and keeps the system stable. A special layer is applied to the Quartz tubes from the outside which reflects the infrared energy that heats the cold water as it passes through the heating chambers. This energy is safe as well as helpful with the condition of hard water deposits. This system energizes your water with the help of the Quartz elements by allowing no corrosion and calcium deposits that heat up the water without instant contact to metal. Through this method, there is a lesser chance of producing bacteria in the water. The IR30 POU operates on four power levels that you can alter manually according to your requirements. You are able to adjust the current from 8 to 30 amps and results in generating power between 0.85kw and 3.4kw. You can change the temperature by using the water flow regulator. If you want to increase the temperature, you can turn the regulator clockwise. There is Thermocouple Constantly Monitor Temperature outlet displays the temperature on your screen. The POU water heater by SioGreen is well designed and is only slightly larger than a shoebox. The space-saving design allows it to fit under any small cabinet and is easy to install. So, you can place or mount it to any suitable place such as a kitchen, bathroom, apartment, or utility room. The RTGH-95 DVLN meets industry standards by keeping the quality and reliability of the product accurate and stable. Because there is an efficient manufacturing process that has overseen every phase from the raw materials to finished products, it ensures excellent quality for the consumer. Rheem products are frequently tested in labs to assess their performance. In addition to that, the company also involves third-parties to check the quality standards. For this reason, the product is also certified according to government benchmarks. In this water heater, a self-diagnostic system is available and it eases up the installation process. An LCD screen displays the temperature of the water heater and other details associated with maintenance requirements or the current status. For commercial use, the operable temperature range is from 85°F to 185°F. One of the best built-in features of this water heater is that it is energy efficient. Approximately 94% of the energy is conserved through its stainless-steel condensing heat exchanger. It enables you to electronically control its intelligent digital remote controls that are specially designed to increase the energy in a safe and efficient manner. A special cable which is known as an EZ-Link cable is used to connect the two different tankless units that work as one. Some products of Rheem have high altitude capability if supplied with a 120-volt power cord and this is only for indoor models. The water heater comes with freezing protection of up to -30°F. In this product, the Cold Water Sandwich technology is used and is excellent in helping minimize the fluctuations in water temperature where this heater automatically performs on/off operations. It also comes with a limited ten-year warranty of a heat exchanger as well as one-year limited warranty for its parts. The Rinnai RL75iN is a well-designed indoor model and is equipped with direct electronic ignition system. The water heater uses a direct vent to continuously control the temperature of the flowing hot water through the system. As the name implies, this water heater consumes gas and its maximum gas consumption ranges from 10,300 to 80,000BTU/h. The temperature range of this product is categorized according to its place of installation or purpose, such as residential or for commercial. For residential use, temperature settings range between 98°F and 140°F and for commercial use temperature settings ranges between 98°F and 160°F. The capacity of the RL75iN water heater ranges between 0.26 and 7.5 (GPM). This means that the water heater can save energy and money too. For this reason, its thermal efficiency is up to 82%. This product can easily support two to three bathrooms in a home. The pressure of the water supply plays a vital role in the operation of this heater. Its minimum pressure is 20 PSI while its optimal performance recommended pressure is 30 to 80 PSI. The water pressure cannot exceed 150 PSI. This heater is covered by a twelve-year warranty for the heat exchanger, five-year warranty for parts, and one year labor that is only for residential installation. The size of the RL75iN heater is large and it is specifically designed for indoors. You can mount it on the wall if you want to conserve space. If you’ve had bad experiences with frequent breakdowns and malfunctions of water heaters, then the Takagi Condensing Water Heater is definitely the right product for you. The Takagi weighs an incredible 59 pounds, and has been a customer favorite since it first came out. The heater requires little to no maintenance, and works automatically as well as manually. The Takagi is great at space saving, with its dimensions of a length of just 11 inches, making it extremely compact and portable, though it is a bit big to handle. This machine is impeccable at keeping the right temperature. Most customers reported that the temperature was maintained exactly how they wanted it, and when I tried it myself, I was baffled by the efficiency. The Takagi Heater truly is remarkable. One drawback of the Takagi is its loudness. Many customers complained of loud noises every time the water was heated, and I have to admit, I thought that the unit was a bit too noisy. One of the best parts about having a Takagi Unit in your home is that there are absolutely zero exhaust fumes. Which means that the unit can run and waste little amounts of gas. 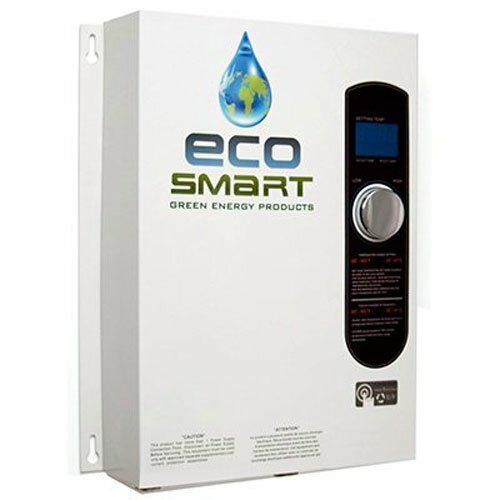 The entire product is cost-efficient and eco-friendly like a good tankless water heater should be. And the best part? There is a one to three-year warranty policy which means that you can be sure that your Takagi Water Heating unit will work for a very long time. It’s definitely worth the price. Although water heaters were an innovation when they first started out, they have now become a bit commonplace in the modern world. However, the Rinnai changes all of that in the blink of an eye. The Rinnai Water Heater relies on a PVC venting system that allows it to give off a monitored temperature. The installation is extremely easy and simple, and setting the Rinnai up in your room will only take a few minutes. The product weighs around 82 pounds, which is a bit heavy, but will hold up against the wall perfectly. The Rinnai has almost zero NOx emissions, which means that the entire mechanism is environmentally friendly. This water heating unit can reach incredible temperatures, all of which are exceedingly comfortable to use. The maximum power of this unit is approximately 199 thousand BTU, which means that the entire machine can operate at tremendous speeds and still function perfectly. The Rinnai Ultra Series Heater is definitely one that is worth your money. The best part about the Rinnai is that it has a very inexpensive price, which means that almost everybody from all financial classes can afford a nice water heater. The Rheem Heater is one like I’ve never seen before. Apart from the fact that the design is entirely compact and deluxe, the overall working power, and heat generated are definitely things that I’ve fallen in love with. For one thing, the Rheem relies on natural gas to heat up the water, with almost zero NOx emissions. So this water heater is extremely safe, and will not poison the air with toxic emissions. This is certainly one of the best offers in town. It is an exceptional choice for those who prefer a lighter model. This unit weighs only 54 lbs. and is extremely easy to install. 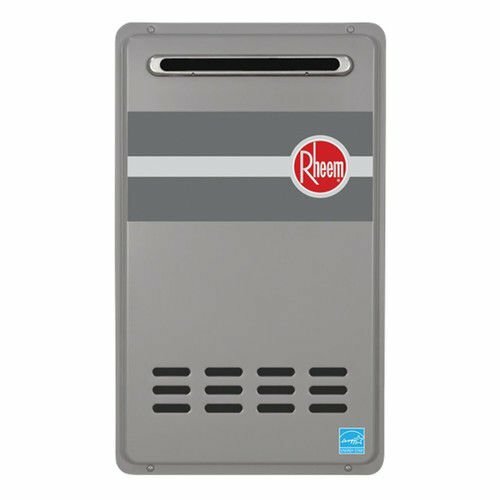 The Rheem is a great choice for all types of users, as it can heat up to 8.4 gallons of water in one minute, with an average temperature rise of about 35 degrees. The best part about the Rheem is that no additional venting is required. Forget about all those PVCs, as this unit will not only be cost-efficient but also extremely convenient. The water gushes out almost instantly. The Rheem takes up hardly any space, and has a 10-foot thermostat wire included in the shipping. What’s more, this unit has a remote control which can operate the Rheem from a far distance. There’s more to the Eccotemp than meets the eye. But of course, what meets the eye is enough to convince me that this product is top of the class. Let’s start with the design; the Eccotemp uses a sleek black look that looks stunning, even if it is in the middle of your entire house. You don’t need to worry about the performance. The Eccotemp works wonderfully indoors. The Eccotemp has child locking technology, which ensures that your children will not touch the settings, mess it up, or injure themselves in any way. This, and the fact that there are zero NOx emissions, makes it the safest and securest heater out there. As for the heating power, the Eccotemp can heat up to three gallons in a minute, which might be just a bit lower than most water heaters, but it is definitely worth the try. The Eccotemp uses a pipe venting system, and the parts and kits may be a bit rare or costly to find, but it is well worth it. And as for the weight, the Eccotemp has a weight of just 28 pounds. This is the lightest we have seen, and we’re sure that you can agree. It also costs nothing more than a regular water heater. Before you decide what tankless water heater fits your home, it is crucial that you understand everything that they have to offer and how they work. Below, you will find all the information you need in order to make an informed buying decision. That way you can be sure to end up with a tankless heater that meets your demands. 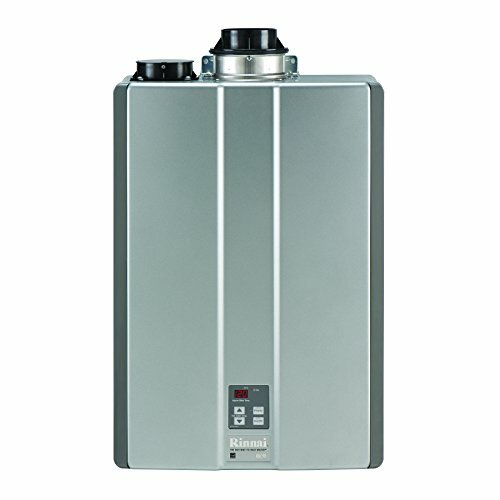 Tankless water heaters rely on the same principle as a tank-style units, in that there is an incoming water supply of cold or room-temperature water, which is heated with the help of a built-in connection to fuel. However, tankless water heaters employ a much superior use of technology. The entire idea of the tankless system is based on the real-time flow of required hot water. As such, they need to be quick and efficient in heating the incoming water as it flows through the heater. The primary component that helps in achieving this is called a heat exchanger, which is essentially a device that transfers heat generated from gas burners or electrical heating coils, to the water that it comes in contact with, primarily through conduction. This technology surpasses the need for having a built-in tank to store hot water because the process of heating water is so fast that it can be done in real time. As you turn the faucet on, cold water flows through the pipes that are in contact with the heat exchanger, which then heat it to the temperature you have set. This is why, with heaters that use gas, LPG or any fuel that may combust to release fumes of any sort, an ignition and exhaust system are necessary to work properly. Typical flow rate ranges from 4 to 5 gallons per minute. Gas powered heaters tend to provide better flow rates than their electric counterparts. However,there are some limitations that apply to all models. Simultaneously catering to high-demand situations can cause them to under perform. For example, washing the dishes and taking a shower at the same time might cause the temperature of the water to be lower than what is preferred because it is not easy to supply hot water for such high-demand activities at the same time. For such situations, it is better to opt for two or more smaller dedicated water heaters that are connected in parallel so that nobody is deprived of hot water. From a customer’s standpoint, it is also important to at least have a sense of what energy and efficiency ratings mean. Heaters that use combustible fuels are rated in BTUs or British Thermal Units, while electric heaters come with kW or kilowatt rating. The higher the rating, the more energy your heater is capable of investing as heat. Efficiency ratings come in decimals between 0 and 1, indicating the percentage of input energy that heats the water and the percentage that is lost. If a heater’s efficiency is rated at 0.80, it means that 80% of the energy you invest in it comes out as hot water while the remaining 20% goes to waste. What is The Difference Between Tankless and Tanked Water Heater? The most significant difference is that a tanked water heater is able to store 30 to 50 gallons of water in the tank. That preheated water can be used whenever you need to use it for taking a shower or for washing dishes or doing laundry etc. Once it becomes empty, it will refill and reheat. As compared to that a tankless water heater heats water by using electric or gas technology and works on the principle of demand. It means that whenever you need hot water, the heater will provide it to you instantly without using storage. Traditional water tanks are larger in size as compared to tankless units ranging from four to six feet in height. These types of units monitor water temperature that is constantly heating the water as per your demands and make sure to provide it. Tanked water heaters cannot be fitted indoor due to its large size. Tankless heaters have a compact size that can fit in a cabinet. This enables you to save space if you are looking to install it indoors or within your living premises. A tanked water heater consumes more energy as it continues to turn on hot water if needed or not. On the other hand, tankless heater saves more energy as compared to tank unit as it turns on whenever hot water is required. But one thing is that the hot water unit turns off if the power unit also shuts off. Product price is a noteworthy difference between a tank and tankless options as well as their installation costs. Traditional water heaters price is affordable but they are not used in the long run and they also have a short lifespan because they are constantly performing their function. These units also need more maintenance. It also increases your utility bill because it heats the water constantly without switching off. Tankless options are costly because of their complexity as compared to tank or traditional units. However, this system saves your money and is a lot more durable as you can use it in the long run, between fifteen to twenty years easily. Gas heaters are difficult to install due to venting and combustion air supply systems. In most cases, the existing venting ducts and gas lines cannot be used. Due to more consumption of gas proper ventilation system is required. It is recommended to install gas powered units outdoors. These requirements make gas heaters an expensive option. The electric heater comes in a smaller size, around one third the size of the gas heater. There is no need for a ventilation system so it can be installed in any place where you feel that it’s convenient. The installation of this unit is generally much cheaper as compared to a gas heater. Either gas or electric, both installations should be carried out by an experienced person who has proper knowledge about handling the equipment. This is because the gas line and electric wiring work are very technical and difficult; you don’t want to make any serious mistakes. If you try to attempt DIY installation process, always remember to follow all the instructions that are given in the product manual. You can also call your product manufacturer to help with installing the heater because they are happy to help. However, there is a chance that by doing yourself, the warranty rights are rendered void, especially if you install it improperly. But if you installed it in a proper manner, you will save labor costs. On the upside, if because the process requires particular skills, labor costs can consist of a significant percentage of your expenditure, which can be saved, provided that you do it properly. Why Should I Descale My Tankless Water Heater? Descaling is important for both units whether you have a tanked unit or a tankless unit because the water containing minerals will cause deposits. A proportion of minerals in the water will be effected according to your country regions. Those people who are living with a higher percentage are said to consume harder water while those with a low percentage will consume soft water. For building up of rust or lime, you can coat heating components including your water pipes and it will enable you to save up to 30 % of energy consumption. For maximum functionality, you should ask the manufacturer team to install it properly because it will; work more efficiently if installed by a professional. You cannot install it by yourself because there are a lot of technical aspects that you need to consider. For example, if you have an electric heater, you should know about electric wiring and if you choose gas heater then you should know how this is related to gas lines. In tankless heater, heating elements are made of copper or more sensitive materials to cater building up minerals. Many manufacturers recommend vinegar rinse to eradicate deposits for the efficient and effective functioning of a water heater. The heating element of a water heater will struggle if you don’t descale your unit and it will consume more energy. So for keeping the mineral residues from building up, you need to regularly maintain your unit. Most people, who are using any type of appliance, don’t pay much attention to maintenance. For getting optimal performance, you should take care of it because frequent maintenance is directly linked to the equipment’s performance. How Does Energy Efficiency Relate to the Size of a Tankless Water Heater? The energy efficiency of a water heater is determined by the energy factors while the energy factors are based on the quantity of hot water that a unit produces over a day. The higher energy factor results with a more efficient water heater. If you think a water heater is ideal for your home, you should estimate its annual cost as well as its energy efficiency. According to recent research, the US is the second largest energy user in the world. Countries like Japan and some in Europe that use tankless models differ in their costs simply because in every country the cost is different. Moreover, the tankless heater is now globally accessible and people are willing to install it in residentially as well as commercially to save energy. If you’re an eco-conscious individual who thinks about environmental concerns then saving energy and efficient water should be your first priority when buying a unit. There are plenty of ways to save water and related energy in our homes. According to rough estimates, tankless model are 24% to 34% more efficient as compared to the standard water heater. This certifies that whenever you need hot water, your heating unit will provide it. On the other side, traditional water tank heater stores the hot water and consumes more energy and automatically drops down. However, it is more cost effective and can be used as an outdoor appliance. Most users save their money by using propane or natural gas along with electric energy and also reduce CO2 emissions. Electric tankless models generate around three-quarters of CO2 emissions. However, it is our responsibility to reduce greenhouse gas emissions and keep our planet clean. Why Should I Go For a Tankless Water Heater Anyway? This is the big question that why should you go for a tankless water heater. The jump to a new kind of technology can be a daunting task, but once the positives of tankless water heaters are understood, no other option seems logical. I have already gone over how tankless water heater technology is better in every way, and how it saves time, money and space in the long run. It might benefit you to know that tankless water heaters are all-around, more intuitive and advanced than tank-style water heaters in terms of modern life. It is time to take a more in-depth look into just how tankless water heaters outmatch conventional technology. To understand this we will touch upon two ideas; firstly, the major problem with tank-style water heaters, and secondly, the nature of water needs in an average household. One aspect of tank-style water heaters that is most commonly ignored is the problem of standing losses. To understand this, imagine a scenario, where you have a conventional tank-style water heater, equipped with a thermostat that allows it to heat water automatically based on the temperature it senses at any given time. Assume that the water is not used for a period of 6 hours. During these 6 hours, the heater will heat the water to the desired temperature and then stop. The water will lay in the tank until its heat is naturally lost to the surroundings, at which point the heater will kick in once again and to heat the water. In this scenario, the amount of heat previously provided, and consequently, the money spent on it in the form of associated fuel usage will go to waste. This process of water repeated losing and wasting heat just by being stagnant in a tank gives rise to what is known as standing losses. This is the major reason conventional water heaters, especially considering the soaring fuel prices these days, are an economically unsustainable option. Secondly, we must understand the nature and patterns of hot water utilization in an average household. It must be understood that hot water is rarely consumed in consistent amounts or at regular intervals. In fact, there are periods and activities during which the demand, and consequently, the quantity used, spike while the rest of the day sees minimal hot water consumption. These periods of low-demand are when you incur the aforementioned standing losses, by the way. Something as mundane as a shower can consume 2 gallons of hot water per minute. Now, imagine the average weekday morning where everybody is busy preparing for work and needs to jump in the shower at once. In such cases, a small 20-gallon tank-style water heater will most probably run out within minutes, while a larger heater might barely cut it, but will take the following 4 to 6 hours to fill up and make hot water available to you. So, not only do tank-style water heaters cause you to waste money during periods of low demand, but also seem to be inadequate during high-demand periods of the day. On the flip-side, tankless water heaters are equipped to tackle both these problems effectively. The problem of standing losses is rendered obsolete in tankless water heaters simply because they don’t allow water to stagnate. Moreover, because there is no tank and water is heated in real time, there is no limit to how much hot water can be utilized at any given time. Meanwhile, the problem of multiple outlets requiring hot water at the same time can easily be tackled by either going for a suitably sized heater or installing the adequate number of tankless heaters across the house. The main feature that these products supply is the instant access to hot water. With an electric water heater, having hot water is simply a matter of turning the faucet. Of course, in reality, you still have to wait a few seconds for the cold water already lying in the pipes to flow out in order for the hot water to follow. That can be fixed through the use of a circulation pump that can be bought separately and attached to the water heater. Resources in today’s world are costly and limited, while at the same time, people have come to develop a keen sense for efficiency and sensitivity to the environment. In that context, it makes sense to use products that not only use as little energy as possible, but also maximize the potential of whatever energy they do use. Therefore, another reason why these products are so popular is because of their efficient use of energy, owing to the simple principle of using energy on a need-to-use basis. They only supply heat when the hot water tap runs, and remain on standby otherwise. Energy efficiency and cost-effectiveness go hand in hand. If your heater is using energy efficiently, it automatically means that you spend less on fuel than you would have otherwise. A good tankless water heater, on average, should last you about 20 years. The duration is rooted in a simple technology that has been around for decades now, which means that humans have had ample time to perfect it. This, combined with high-quality hardware by trusted manufacturers makes for an astounding durable combination. The other reason they are so durable goes back to the idea of the need-to-use mechanism as these heaters work only when they need to, meaning that there is less wear on parts. The name says it all; tankless models are not accompanied by a cumbersome water tank. As a result, they are small, lightweight making them easy to transport. The smaller size also allows them to be more versatile in terms of placement, which will help you maximize space in your home. With tank-style water heaters, there is always the risk of water being stale considering that it has been sitting in a tank for a long time. However, that is not an issue with tankless water heaters since water that is heated flows into the heater as it is needed and is not allowed to stagnate at any point. The choice between a gas heater and an electric heater is one the most important considerations you need to make when choosing a tankless water heater. Prices vary greatly based on whether a model is electrically powered or gas powered; gas-powered models being more expensive. For gas powered models, outdoor units tend to be more expensive than indoor ones. Electrical units are generally the cheapest. This is due to their small size and lower output flow rate. With electrical units, the main consideration is the amount of electrical power that they require. It is important to assess whether you have the necessary electrical wiring to house such a heavy load. In case you don’t, you may have to spend extra on modifying and upgrading the wiring on your panel. You also need to remember that the significant electrical requirements of a tankless system mean that you may have a problem allocating power to your heater if you already have other heavy appliances running. It may also cause an increase in your electrical bills if you go for a heavy duty electric heater. On the other hand, the major consideration for gas-powered heaters is having the necessary electrical situation, both for the supply of gas as well as the ventilation of exhausts. If you have a built-in gas connection you may be restricted to placing it next to an outlet. If not, you may have to spend money on hiring a service to accommodate the heater. Companies also have very specific exhaust requirements for gas heaters, which too, will require extra pipework and will dictate where you can or cannot place your heater, especially keeping the safety considerations of indoor heaters in mind. Outdoor units meanwhile may not pose such a challenge since the open ventilation is taken care of, and the supply of oxygen is virtually endless. Owing to their specific technology, tankless heaters also require very specific expertise. More often than not, you have to hire a skilled laborer to install your tankless water heater, which may add to the initial cost. However, it is important to remember that the initial setback from any of these complications is still small when you divide it across the number of years you will have your tankless heater. It is also worth noting that these costs are still nowhere close to what you may spend on a tank heater in the same span of 15 to 20 years. Within gas powered tankless water heaters, in most cases, you will further be faced with the choice of whether to go for a natural gas-powered heater or a propane-run heater. More often than not, this decision is driven by availability more so, than by choice. The first consideration that should be made is whether you have quick and easy access to the fuel that your heater of choice uses. Opting for a natural gas-powered heater means that you have natural gas available in your area, in which case I the heater can easily be connected to the mains supply. In cases where users do not have access to natural gas, a propane-powered water heater will have to be used. Natural gas is generally cheaper than propane per unit. Not only that, but it burns more cleanly as well, making it a better choice than propane overall. With some expert assistance at the time of installation, you can have a reliable natural gas powered system in your household. If you go for a propane-powered heater, it means you have a propane tank connected to your heater or heaters at all times. The best part about a propane-based system is that it is very easy to set up; perhaps the easiest. However, do bear in mind that propane does not burn as cleanly as natural gas, so ventilation of exhaust fumes becomes all the more important with propane-powered water heaters; not that it should be neglected with natural gas powered systems. If it is all the same to you, then going for the natural gas-powered tankless water heater is a better option out of the two as it is both, more environmentally friendly as well as cheaper in the long run. With these water heaters, bigger is always better. If you go for a larger model, you will have more room to simultaneously distribute the hot water supply. It will also heat the water much more quickly, and the temperature difference between input water and output supply will be greater. However, larger water heaters will also cause greater energy costs per unit volume of water heated since they use higher power exchange to heat water. At the same time, the heated water will run less than it would if it was smaller. Ultimately, you will have to assess three main factors before deciding what kind of water heater to get. First, you will have to see how many occupants regularly use hot water. A number of occupants are usually indicative of how frequently the heater will experience simultaneous demand. Second, you will have to see which activities or appliances in your household require the hot water. Third, you will have to see what kind of climate you live in. With a small family with moderate usage, a normally sized heater will adequate, however, if the family size is larger, you may need to go for a larger heater so that it distributes hot water easier. Similarly, if your household has a high demand for activities that are carried out simultaneously, you may opt for a larger option simply because the volume of water needed can be supplied by a larger heater. If you live in a cold region where snow days are common you may have to go for a larger heater regardless of house size because the incoming water will be near freezing temperature. Whereas, a smaller heater for the same family in a warmer climate will be fine. With a Tankless Water Heater, do I Have to Change The Way I Use the Shower? Every decision to do something new implies some kind of change. However, the recommended way of using a tankless heater’s water supply is to allow the hot water to flow at the maximum rate. Once the water is as hot as it can be, cold water should be used to fine-tune its temperature. This method allows the water heater to function at maximum efficiency, while also providing you with maximum control. If the Power is Out, Will My Electric Tankless Water Heater Still Work? It will still allow the water to flow through but it will not be heated because the heating element, which relies on electricity to work, will not have the necessary electrical supply. How Long Does the Water Take to Actually Become Hot? The lag between turning the tap on and hot water flowing through is mere seconds long. That too is not because the heater takes time to start working, but because there is water sitting in the pipelines prior to usage, which needs to flow out in order for the hot water to start flowing out. Meanwhile during these few seconds, the temperature of the water being heated also approaches the peak temperature. Do High Altitudes Affect Tankless Water Heaters? For electric heaters, not at all. With gas-powered heaters, however, efficiency is generally lost at a rate of 4% beyond altitudes of 400ft, unless your unit is made for use at higher altitudes. 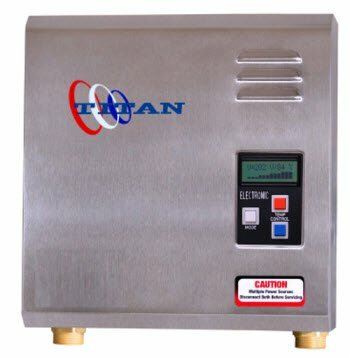 Is it Good Idea to Replace My Existing Water Heater with a Tankless Model? Thinking of the logical answer to that would, of course, be yes. However, at the end of the day, like most things it comes to the individual’s personal circumstances. If you have a working tank-style system that you recently spent money on, maybe you should try to extract its value before making the switch. Meanwhile, if you have been looking for a chance to switch, this might be the next step for you. You have to make that call, ultimately. Is it Possible to Know How Much Hot Water I Need? The right way to go by it would be to consult the user manuals of all the fixtures in your house through which hot water is supposed to run. There should be a rating in these manuals for the respective fixtures, in gallons per minutes, which will basically specify the flow rate of each fixture respectively. In order to calculate how much hot water you need, you will need to calculate average time of use for the fixtures in question and multiply it with their respective flow rates to get a reasonable estimate of how much hot water you tend to use daily. However, if you are looking for a very rough estimate, the rule of thumb is to assume three gallons per minute (GPM) per bathroom. What is Maximum Temperature Rise? It is the maximum rise in the temperature that the heating element in your water heater can ensue when running at maximum power, in the incoming groundwater. Ratings of maximum temperature rise can be an important factor in the choice for a tankless water heater, as it will give you a sense how hot your hot water will be. This is an especially important concern during cold climates. What are the Downsides of the Tankless Water Heaters? Every piece of equipment is bound to have some downsides. For tankless water heaters, one of the major downsides is cost. While running costs are much lower, they are more expensive than their tank-style counterpart in terms of purchase as well as installation. You will need to worry about setting exhaust and ventilation systems even after you have purchased the unit as well. You will hear frequently, of the cold-water sandwich problem by those who do not find the idea of tankless heaters convincing. We will discuss this in the next section. Lastly, just as the tank-style system poses limitations in the quantity that can be used at once, tankless heaters limit the number of users that can use hot water at once. The nature of the technology is such that can accommodate a certain extent of simultaneous users. However, this is not even a problem, if you carefully assess your requirements before purchase and opt for a suitably sized and powered tankless system accordingly. What is The Cold-WaterSandwich Problem? To start with, the so-called cold-water sandwich problem is overrated.It is a name given to the few seconds of cold water you have to experience before hot water flows through. This is basically a result of the kind of technology tankless heater employ. Because they heat the water as it is needed, naturally, the water sitting in the pipes when the faucet is off, tends to lose heat and get cold. Once the tap is on, in order for the hot water to reach it, the cold water needs to be flushed out first. This necessary flow of cold water is termed as the cold-water sandwich. However, it is important to remember that it is not even a problem in most cases, and becomes a cause for concern only in larger houses or in cases where the distance between the faucet and the heater is significantly large. Meanwhile, there is no reason the same problem cannot occur in tank-style heaters as well. If you live in a house where the tank heater is far away from the faucet where hot water is required, you are likely to encounter the same problem, however, to be fair, the chances of that happening as slightly lower. It is no secret that the initial cost of tankless water heaters can be two to three times as that of equivalent performance tank-style heaters. Furthermore, it is likely you will have to spend a considerable amount on hiring professional help during the installation process. We can expect that to be several hundred dollars, although the exact amount will vary greatly based on where you live and how familiar you are with the market. Lastly, you will have to spend on building the capacity within your existing infrastructure to accommodate a tankless water heater. This might include installing exhaust ventilation systems or creating new electrical outlets etc. How Does “Hard Water” Affect My Tankless Water Heater’s Performance? We have already talked about the importance of regularly having your water heater scaled. If you used it with hard water, it simply increases the likelihood of calcium deposits appearing on your heating element. While scaling is inevitable, particularly hard may simply increase the need and frequency of scaling. Whatever the case, it is very important to keep a regular check on your heater if you are using hard water, and not allow too much mineral deposit to calcify on the heating element, as it can cause hard water damage, or in extreme cases, complete breakdown. As rule of thumb, when using hard water, descale your heater with store-bought descaler and rinse with white vinegar, between every 6 months to a year. Stating all the reason that make tankless water heating systems superior to the other options is not possible in the span of one guide. However, the most important takeaway from this should be understanding that if you want to save energy cost, move to a more efficient and cost-effective use of energy that will help the planet. You should definitely consider switching to a tankless heating system. In order to find the right product for yourself, the first thing you must assess is your usage patterns, the volume of water you consume, how frequently you need hot water, and most importantly, how much money you are willing to invest. Even though the tankless model is inherently cheaper in the long run than a tank system, finding the right balance between all these factors will allow you to go for the optimal arrangement for your household.